The cranial nerves are a set of 12 paired nerves that arise directly from the brain. The first two nerves (olfactory and optic) arise from the cerebrum, whereas the remaining ten emerge from the brain stem. The names of the cranial nerves relate to their function and they are also numerically identified in roman numerals (I-XII). In this article, we shall summarise the anatomy of the cranial nerves. There are twelve cranial nerves in total. The olfactory nerve (CN I) and optic nerve (CN II) originate from the cerebrum. Midbrain – the trochlear nerve (IV) comes from the posterior side of the midbrain. It has the longest intracranial length of all the cranial nerves. Midbrain-pontine junction – oculomotor (III). Pontine-medulla junction – abducens, facial, vestibulocochlear (VI-VIII). Medulla oblongata – posterior to the olive: glossopharyngeal, vagus, accessory (IX-XI). Anterior to the olive: hypoglossal (XII). The cranial nerves are numbered by their location on the brain stem (superior to inferior, then medial to lateral) and the order of their exit from the cranium (anterior to posterior) (Figures 1 & 2). 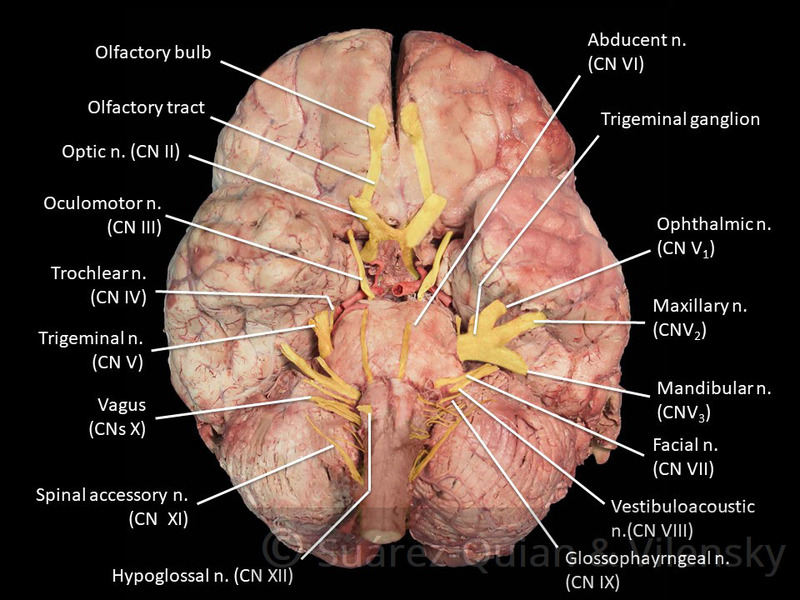 Figure 1 – The location of the cranial nerves on the cerebrum and brainstem. 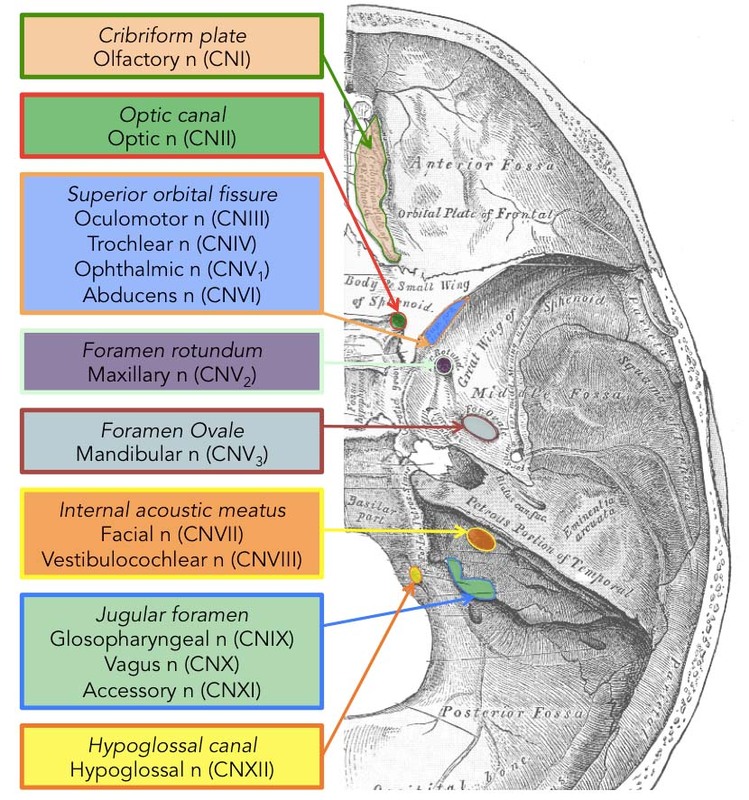 Figure 2 – Superior view of the skull base showing the foramina and which cranial nerves pass through them. Tip: Cranial nerves with the number 2 in them (e.g. 2-optic and 12-hypoglossal) exit through a canal of the same name. They are the only cranial nerves to pass through canals. Simplistically, each cranial nerve can be described as being sensory, motor or both. 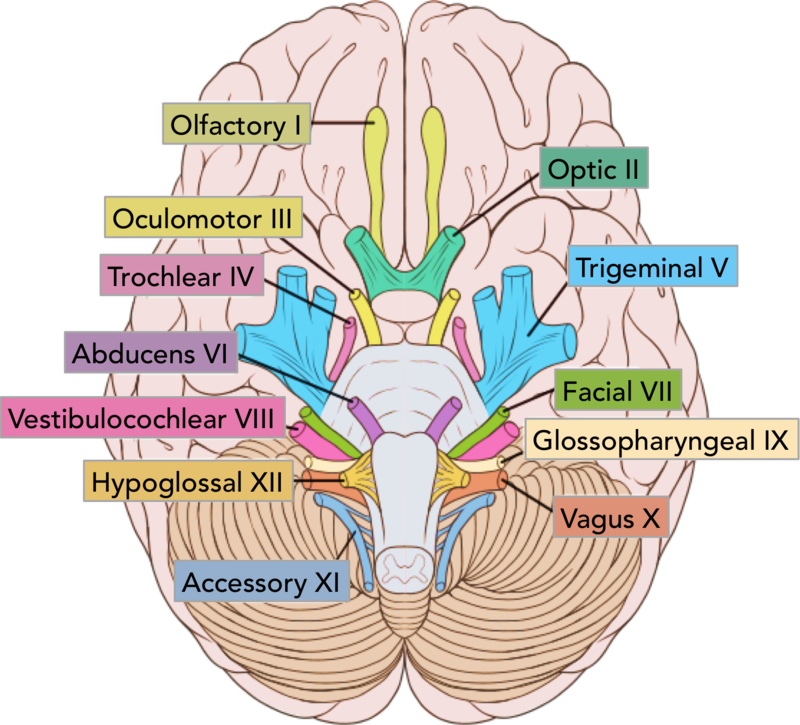 They can more specifically transmit seven types of information; three are unique to cranial nerves (SSS, SVS and SVM). See table 1 for a summary of the cranial nerves, their modalities and functions. General somatic sensory (GSS) – general sensation from skin. General visceral sensory (GVS) – general sensation from viscera. Special somatic sensory (SSS) – senses derived from ectoderm (e.g. sight, sound, balance). Special visceral sensory (SVS) – senses derived from endoderm (e.g. taste, smell). General somatic motor (GSM) – skeletal muscles. 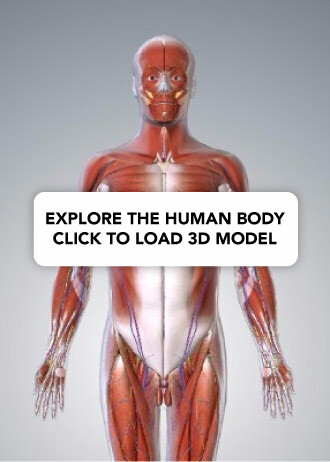 General visceral motor (GVM) – smooth muscles of gut and autonomic motor. Special visceral motor (SVM) – muscles derived from pharyngeal arches. (GSM & GVM) GSM: 4 extrinsic eye muscles and levator palpebrae superioris. Ophthalmic Superior orbital fissure GSS Scalp, forehead and nose. Maxillary F. rotundum GSS Cheeks, lower eye lid, nasal mucosa, upper lip, upper teeth and palate. SVM GSS: anterior 2/3 tongue, skin over mandible and lower teeth. GVM GSS: sensation to part of ext. ear. SVS: taste from ant. 2/3 tongue, hard and soft palate. SVM: muscles of facial expression. GVM: lacrimal, submandibular, sublingual glands and mucous glands of mouth and nose. SVM GSS: post. 1/3 tongue, ext. ear, and middle ear cavity. GVS: carotid body and sinus. SVS: taste from post. 1/3 tongue. SVM GSS: ext. ear, larynx and pharynx. GVS: larynx, pharynx and, thoracic & abdominal viscera. GVM: smooth muscles of pharynx, larynx and most of the GIT. SVM: most muscles of pharynx and larynx. (GSM & SVM) GSM: trapezius and sternocleidomastoid. SVM: a few fibres run with CNX to viscera. (GSM) Intrinsic and extrinsic tongue muscles (except the palatoglossus). 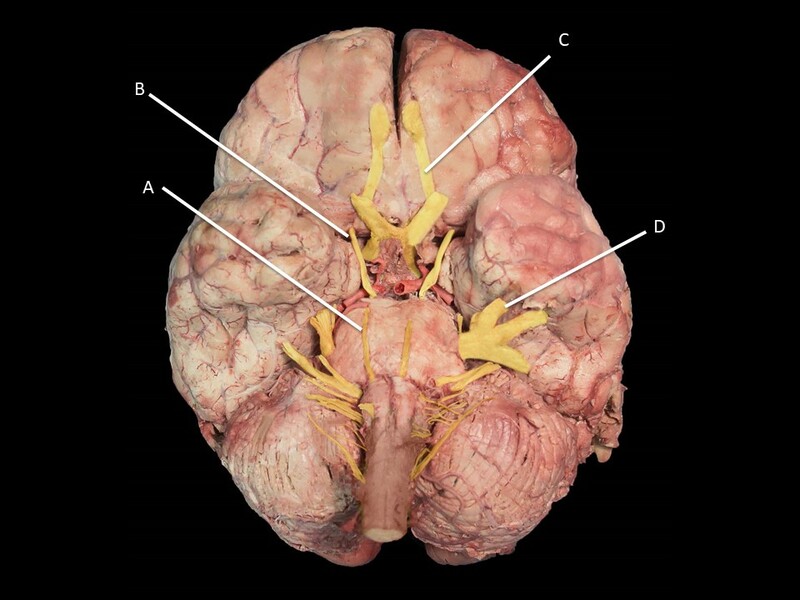 Prosection 1 – The base of the cerebrum, demonstrating the origin of the cranial nerves. Which of the following cranial nerves arise from the pons of the brainstem? Which nerve is confirmed to be intact if there is feeling of sensation at the tip of the nose?